Christmas is right around the corner! If you’re looking for a nice gift for a friend, family member or perhaps your boss, take a peak at the Box of Joy by JACEK Chocolate Courture. This box has all the chocolate-y goodness you could want in a holiday gift, with the presentation to match. 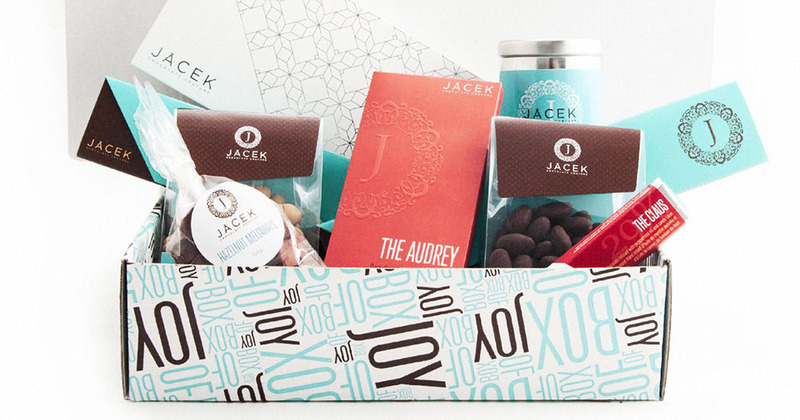 Alberta-based JACEK (pronounced ‘Jay-seck’) was founded by Cocoanista Jacqueline Jacek. She and her team make delectable chocolates with sustainably sourced cocoa beans from Costa Rica, Dominican Republic and Colombia. JACEK won at least one award per year (if not more) since 2011, proving that these beautiful little treats are packed full of quality. JACEK creates new treats every season. For the holidays, they have their Box of Joy – Christmas Edition. It features a curated selection of hand-crafted chocolates, artisan bars and more, all wrapped up in a fashionable, yet classic, teal box. As with anything artisanal, not every flavour combination works with every palate. But JACEK does a great job packing a lot of options into one holiday-themed box. Each of the items included hits the mark for quality and is a small piece of art. The price tag on this box is a bit high. But it is well worth the cost. Unfortunately, JACEK chocolates are not certified gluten-free, and they can’t guarantee there won’t be traces of tree nuts. The team does do their best to prevent contamination. If you have a dietary restriction, you should check their FAQs page to confirm that they can accommodate.